Further building upon the foundation from our last articles on foot/ankle and knee health, we continue moving up the kinetic chain to examine the hip. Although the hip is a source of much chronic pain and injury we must recognize that it can be at the mercy of the highly mobile foot/ankle below and spine above. For simplicity we will keep with our examination of hip issues independently, however it’s important to keep in mind hip pain can have origins below and above. The hip is one of the most mobile joints in our body. Couple this mobility with the fact that it is also one the largest weight bearing joints and we begin to understand how the hips can become injured easily. When all tissues are in balance and the joints involved (there are several) are in alignment the hips can move with ease over long distances while bearing heavy amounts of stress. To ensure this article stays a reasonable length we will not be discussing the different self-care options. Feel free to explore the internet or contact Hybrid Health for further information. Many hip issues can, and should be, self-managed. This takes a little education and self-discipline (easier said than done). However due to the complex nature of the hips a thorough assessment from a qualified professional is advised. The hip flexors are one the most restricted muscle groups in our body as a result of prolonged sitting, side sleeping, and repetitive use. Many people spend upwards of 20 hours a day with the hip flexors in a shortened position. When the body spends this much time in one position it begins to change its shape and form to best accommodate these unique stresses. 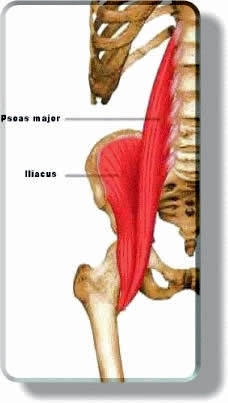 The Psoas muscle originates off the front of the spine and for most is the largest and strongest of the hip flexors. When this muscle begins to shorten it will drag the vertebrae of the low back forward, placing increased stress on the disks leading to bulges and herniations. If this pull is uneven from left to right it can create nerve compression that will cause pain and weakness down the hip and leg. The Iliacus muscle arises off the inside of the Ilium bone and attaches at the same place as the Psoas on the inner part of the femur. Because of its direct attachment onto the Ilium it has the strongest potential to cause SI joint issues. When one side of the Iliacus is tighter than the other it will grab that Ilium and drag it forward and down. This places a rotatory torsional stress to the very strong SI ligaments in the back of the pelvis causing local sharp pain. The Tensor Fascia Latae (TFL) is often over recruited since it works both as a lateral stabilizing muscle and hip flexor. For many their gluteus Medius and Minimus are weak which causes the body to activate the TFL when it perhaps should not have been. 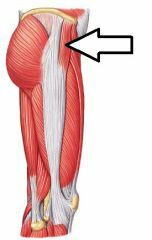 As this muscle is the main contractile element of the IT band (along with Gluteus Maximus), tightness to the TFL causes IT band related pain both at the hip and along the attachment on the outside of the knee. On the back of the hip we have a group of six muscles responsible for rotating our legs outward. The vast majority of the population does not walk with their feet in a neutral forward facing position, and of that majority most are externally rotated. This creates a shortening in these tissues which can lead to posterior hip pain and stress to the sciatic nerve. The Piriformis muscle is the largest and most recognized of this group. Many people get diagnosed with sciatica when in fact it is not the spine compressing the nerve it’s the soft tissues of the deep six. Most studies site the Piriformis as the main muscle responsible for this nerve compression however new theories now show it is perhaps one of the smaller ones lower down. Regardless, stretching and mobilization of this group as a whole will allow the femur and foot below to assume a more neutral position allowing for optimized mechanics and decreases in nerve irritation. 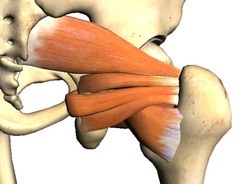 On the outside of the hip lies the Glutes Medius and Minimus. Together they are responsible for a great degree of lateral stabilization. Due to the nature of our society – we have little need for constant lateral stabilization as we walk on flat surfaces and rarely call upon them to function at full capacity. Due to this lack of utilization these muscles become restricted and weak. The weakness forces the body to call upon the shortened TFL to help out which leads to further irritation at the hip as well as the IT band down the leg into the knee. Glute tightness also leads to a lack of blood supply and the potential for trigger point development. 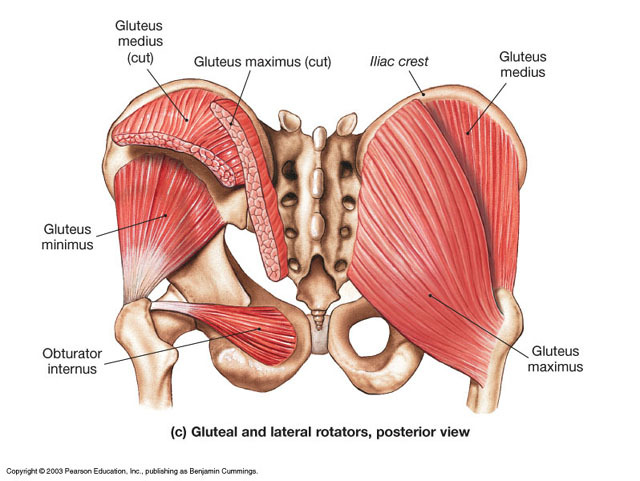 The Gluteus Medius can refer pain through the lateral hip and into the low back while the Gluteus Minimus can send pain down the entire back and outside of leg mimicking sciatic pain patterns. The Gluteus Maximus found on the back side of the hip is one of our primary hip extensors. This muscle is often weak and hypotonic due to the shortened hip flexors. When the Gluteus Maximus doesn’t fire properly we call upon our hamstrings and low back to do more of the work. This leads to high hamstring strains and low back pain. 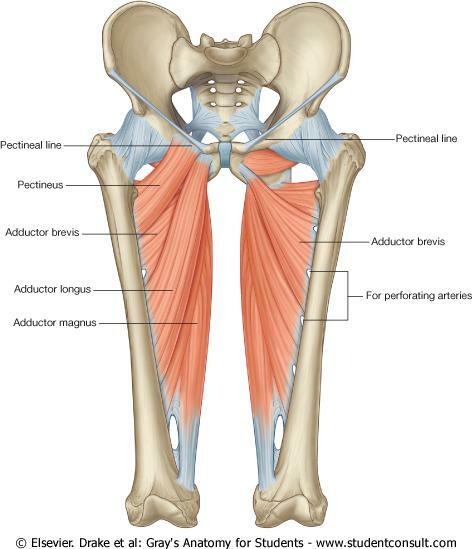 The adductors on the inner side of the thigh are one of the more ignored muscle groups in the body. Along with the Gluteus Medius and Minimus they play a strong role in lateral stabilization. In addition, due to the numerous amount of muscle fiber directions found throughout the different muscles, we see the adductors support movement in all actions of the hips. The long Sartorius on the inner thigh attaches on the Pes Anserine at the inner knee and is the source of inner thigh tightness and knee pain. The adductors longus and brevis tend to become tightened to help stabilize the hip. This lends itself to a decreased range of motion and an increased likelihood for groin strains. These pulled muscles can range from mildly bothersome to extremely limiting. As stated at the beginning of this article, to find the root cause of hip dysfunction we have to always consider and care for the foot, ankle and lowback/spine. Dysfunction in these structures causes the hip to compensate and take on an additional amount of responsibility that cannot be sustained. For any questions or if you wish to dive deeper into these anatomical relationships please feel free to contact Hybrid Health at any time.